Considered by many to be one of the best pound-for-pound boxers of all-time, Manny Pacquiao has amassed ten world championships in eight different weight classes during his storied career. Although he has lost some of his dominance as he has aged, Manny Pacquiao remains a force in the boxing world and with collectors. The following guide highlights the top Manny Pacquiao boxing cards of all-time. 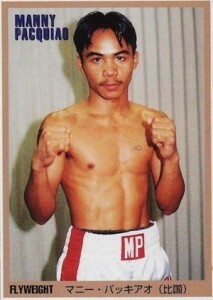 Despite winning his first world title in 1998, collectors did not have many official card options for Manny Pacquiao until over a decade later. Fortunately for collectors, Pacquiao was featured in several 2011 Topps Baseball products and these remain some of his most desirable card options. Although hobby interest for the Filipino boxer has normally been strong, things have picked up even more since his long-rumored fight against Floyd Mayweather Jr. was finally made a reality. If Pacquiao prevails in the epic bout, his card values will surge. 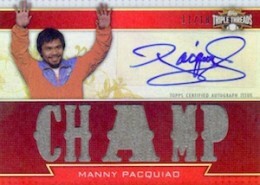 The list below includes ten of the best Manny Pacquiao cards currently available to collectors. View a detailed collecting profile for Manny Pacquiao here. While it may not fall under the traditional definition of a card, the earliest known boxing card for Manny Pacquiao was included as part of an uncut page in the February edition of 1999 World Boxing. The Japanese release is fairly tough to track down and a hand-cut PSA 9 card sold for $510 in February of 2015. 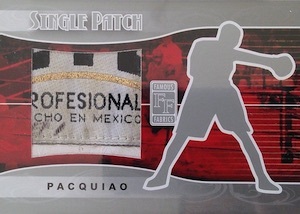 The generic look of the Single Patch card in 2010 Famous Fabrics First Edition is tough to ignore, but the impressive Manny Pacquiao fight-worn boxing glove piece makes it a notable option. Limited to just nine copies, these do no surface often. 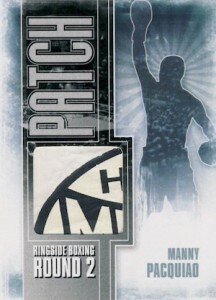 Similar to Famous Fabrics, 2011 Ringside Boxing 2 goes the generic route with the Patch card for Manny Pacquiao, despite being a boxing-specific release. Also like Famous Fabrics, the card redeems itself with an large fight-worn patch piece for Pacquiao. Although it is just a base card in 2011 Topps Allen and Ginter Baseball, many view this Manny Pacquiao card as his official rookie. In addition to the main version, there are also full-sized and mini parallels. 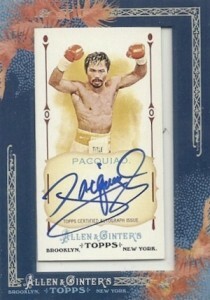 Along with his first base card, collectors can find one of the earliest pack-pulled autographs for Manny Pacquiao in 2011 Topps Allen and Ginter. The framed mini card is hard-signed and a red ink parallel, limited to ten, offers more rarity. 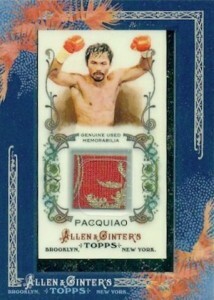 Utilizing the same frame and basic design as the autograph card, the fight-worn relic cards for Manny Pacquiao present more boxing options in 2011 Topps Allen and Ginter. 2011 Topps Marquee Monumental Markings boasts a large on-card signature for Pac-Man and a smiling face as he acknowledges the crowd. Collectors can also find a limited Gold parallel, numbered to 50. 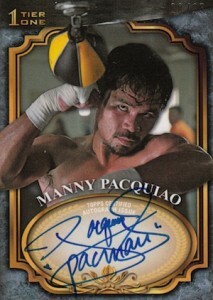 Showcasing a more intense image of Manny Pacquiao in the middle of a training session, the 2011 Topps Tier One Autograph is enhanced by a "pacman" inscription. The Gold parallel, numbered to 25, is shown below. 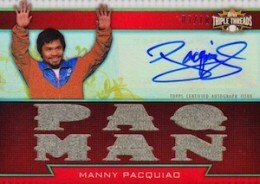 Topps Triple Threads is the final 2011 baseball product to pay homage to Manny Pacquiao with a signed card. 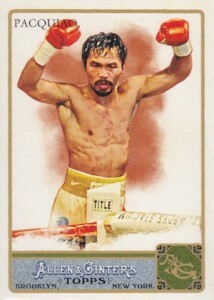 The release includes three versions of an autographed relic card for Pacquiao, with each displaying a different tagline for the die-cut relic portion. Each version is numbered to 18 and there are also several low-numbered parallels. 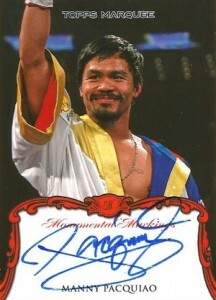 While the 2011 Topps autographs for Manny Pacquiao are some of his top cards, they are also some of the most expensive. Collectors who are looking for a more affordable signed card for Pacquiao should check out 2012 Leaf Cut Signature Edition. Each of the 50 signed Manny Pacquiao cards found in the product are slabbed by Beckett and feature a cut autograph for the boxing great. 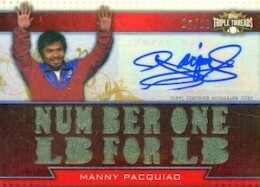 Pacquiao also has cut signature cards in other releases, but they are much more limited.